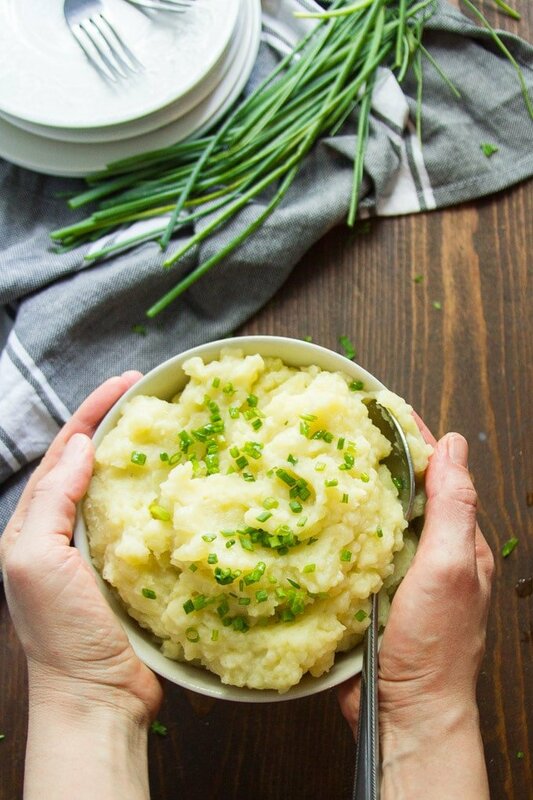 These fluffy vegan mashed potatoes are infused with the intense and savory flavor of truffle oil. They’re perfect on their own or smothered in you favorite vegan gravy. 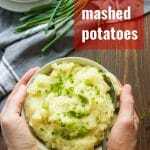 I don’t have many Thanksgiving mashed potato recipes on the blog. That has absolutely nothing to do with my love for mashed potatoes though! Mashed potatoes are probably my favorite Thanksgiving course. I could make an entire Thanksgiving meal of mashed potatoes! In fact, I’m sure at some point or another I probably did, just because there wasn’t much else I could eat at the table. Okay, that’s an exaggeration, but there have certainly been many-a-holiday dinners where 50% or more of my plate was taken up by mashed potatoes. 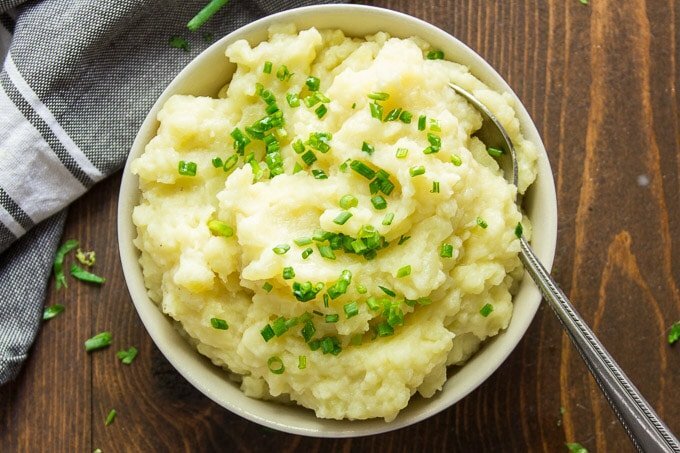 The only reason I don’t share that many recipes for vegan mashed potatoes is because it’s kind of obvious how to make them. Of all the Thanksgiving dishes, I probably get the fewest requests for vegan mashed potatoes, because duh: potatoes + milk + non-dairy butter is enough to veganize just about any Thanksgiving mashed potato recipe. And this one uses all of those things. But, it’s extra special, because of one stupid little ingredient: truffle oil! Truffle oil makes most things taste amazing. The first time I gave my husband a sample of food with truffle oil he proclaimed that he got a food high from it. It’s so good! But truffle oil is especially amazing with creamy, salty, carby foods. Like last year’s Thanksgiving lasagna. It occurred to me when I made it that I should put some truffle oil in the mashed potatoes as well, and I patiently waited an entire year for a new Thanksgiving season to do so. These potatoes are so simple to make. Boil up the potatoes, add your milk, vegan butter, garlic, truffle oil and salt. Mash away! Just cook the potatoes until they’re fork tender. This is so important! Have you ever made a batch of gummy, gloppy mashed potatoes and wondered what went wrong? You probably overcooked the potatoes. Can’t I just add truffle oil to any old mashed potato recipe? Yes, you can! This is my recipe, but feel free to use yours or veganize grandma’s old recipe and throw in a tablespoon of truffle oil. The recipe calls for white truffle oil. Can I use black truffle oil instead? Yes, you can! The flavor will just be a bit more intense. I prefer whipped mashed potatoes. Can I whip these with an electric mixer? Be my guest! 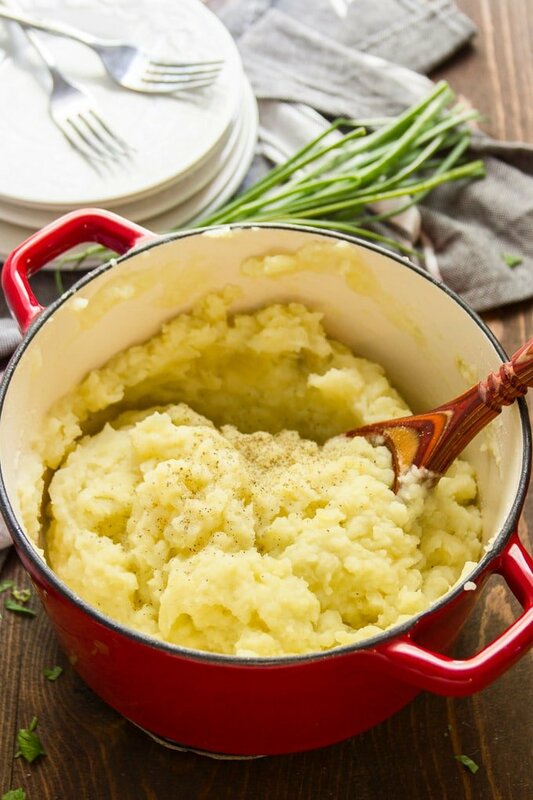 Need a gravy recipe to go with your mash? Try my super simple vegan gravy or whiskey mushroom gravy. 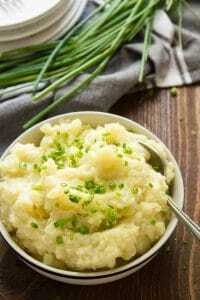 These fluffy vegan mashed potatoes are infused with the intense and savory flavor of truffle oil. They're perfect on their own or smothered in you favorite vegan gravy. Place the potatoes into a large pot and cover them with water. Allow the potatoes to cook for 12 to 14 minutes, just until fork tender. Don't overcook them. Remove the potatoes from heat and drain them into a colander. Return the potatoes to the pot. Add the vegan butter, 1/2 cup of milk, garlic, truffle oil, and salt. 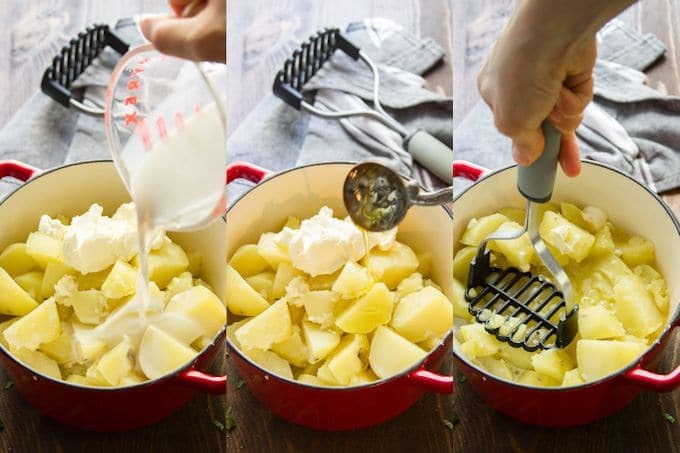 Mash the potatoes to your desired consistency with a potato masher. Add up to an additional 1/2 cup of milk, as needed. Taste-test and season with additional salt and pepper to taste. Serve with chives and vegan gravy, if desired.